How can distinct seascapes be identified as part of the MSP process? How can cultural heritage be incorporated into the MSP process? Following on from work undertaken by the Countryside Council for Wales in 2009 to define ‘Regional Seascape Units’ and further studies in 2012 piloting Marine Character Assessment at different scales, the National Seascape Assessment was commissioned by NRW in 2015 to provide an evidence base for seascapes in Wales as part of work on the Wales Marine Spatial Plan. The Assessment aimed to identify Marine Character Areas and separate Visual Resource Mapping to inform discussion about marine areas along the Welsh coast and their identity. Information about Marine Character Areas was also intended to help integrate the Marine Plan with land use planning. Drawing on the methodology used by the Marine Management Organisation in England and guided by Natural England’s ‘Guide to Seascape Character Assessment’ published in 2012, the Marine Character Assessment was produced by combining a number of research activities. First, relevant GIS data was assembled, using Natural England’s ‘Seascape Wheel’ to structure data collection around key themes of seascape (e.g. natural, cultural and aesthetic). Spatial data and local knowledge (perceptions of space, local names) were used to produce draft MCA boundaries. A desktop-based survey of additional written information was then interpreted to develop the key characteristics of each MCA and shared with a Steering Group for feedback. Field surveys to verify the draft MCAs were also undertaken. Stakeholder engagement through online questionnaires and workshops were used to feed further information on the draft MCAs, in particular on their boundaries, key characteristics, cross-referencing to designated landscapes and names. Following the field survey verification and stakeholder engagement phases, the map of MCAs and a description for each was finalised. A separate Visual Resource Mapping exercise, using viewshed analysis was also undertaken. This identified features that could be seen from specified observation points, taking into account altitude and the local horizon. This enabled a quantitative approach to understanding which areas of sea surface are most visible from the land (i.e. most extensive sea views). Whilst this does not provide a full understanding of visual impacts, taken in conjunction with other data the VRM could be used to inform descriptions of Marine Character Areas in terms of the contribution views of the sea can make to sense of place. Draft outline areas to be used in developing future seascape character assessments at local scale right across Wales. 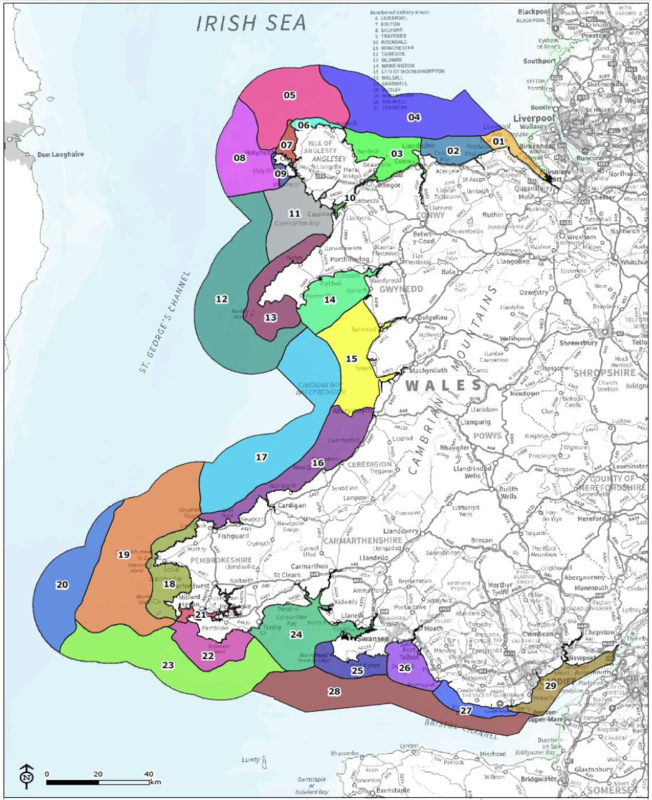 The methodology used for identifying Marine Character Areas in Wales was consistent with the methodology defined by the Marine Management Organisation for a similar exercise in England, therefore demonstrating that it already has a level of transferability within the UK context. With clear guidance this methodology (incorporating GIS analysis, desktop study, fieldwork and stakeholder consultation) could be adapted for use in other country contexts.